The following day we drove onwards towards the centre of the Island our first stop was Nelson Falls part of the Franklin Gordon Wild Rivers National Park, the walk to the falls was easy and as there had been some rain, they were flowing well. We carried on through the mountains us following Scott and Kelly, when they suddenly pulled over a jumped out of the van, Kelly had, had a leech on her from the damp walk to the falls!! We stopped again at an information board it detailed the mountainous landscape, Frenchman's Cap is 1443m high and in front of us were the 3 peaks of the King William range the highest being Mt King William III at 1359m, we were pretty high up! Further along the road was Lake St Clair National Park, the lower half of the joint national park with Cradle Mountain. 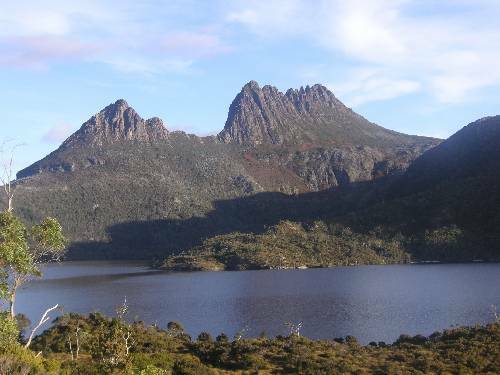 The two national parks are joined by the immense Overlander Track, 65km of bushwalking track which takes on average 6 days to complete. We decided to have a hot chocolate before setting off on some of the shorter walks! We started off and reached the watersmeet walking track where the Hugel and Cuvier rivers meet we decided to take to walk along to Cynthia Bay. At Platypus bay there are wooden walls with viewing slots cut out so that you can try and spot a platypus in the lake, you have to be quiet and still, but we were still unable to spot one. We were there at midday and the best time to see them is early morning or late afternoon. We gave up the search and completed our figure of eight walk along the Larmairremener tabelti, an Aboriginal Cultural walk through the forest. As we still have so much to see we decided to head onwards and to a campsite where we could have a shower. We stopped at a campsite on or map, it was really in the middle of nowhere. We booked in and the owner told us that he had to dash off to open up the pub in the village, we decided to head in and go to the shop. Well the village was pretty no existent, a few houses and garage with 2 pumps which was also the shop and a pub which looked lie a community hall, it was open 4.30pm to 8.30pm!!! The shop was shut as the lady was ill, it was like being transported to the back of beyond, very backward! We went back to the campsite and we all looking forward to nice hot shower, we then realised that we had to pay $1 for the privilege of five minutes, we were disgusted that we had to pay extra and we're so pissed off we tried to get our money back and leave, we finally calmed down and became more rational, we were getting so wound up at 50p each! We had some pasta and meatballs for tea and another camp fire, we were joined by a couple of possums that started fighting up a tree. The following day we started off at yet another National Park, this time Mount Field National Park where we walked to the famous 40m high Russell Falls and Horseshoe falls. The walk was quite easy and pretty as we went through fern forest and some of the highest trees in the world. We then drove on to Hobart our stop over for the weekend and Kelly's birthday. We found our way to the centre and had a subway for lunch and then went to the internet to book our ferry back to the mainland for next Thursday night. We had a quick look around the town before finding a caravan park just outside the City called Treasure Island. We cooked a Kangaroo stir-fry and sat and watched B Witched on the TV. On Saturday we headed to the City and Salamanca Place where a huge open air market was underway, there were stalls selling absolutely everything and it was a great place to wander around for a few hours. It was also pretty chilly and reminded us of home a lot. Hobart it very small but has a lovely feel about it, very old and compact. After we had finished browsing around the market we went to the Tasmanian Maritime Museum and then treated ourselves to some delicious fish and chips from a floating seafood stall at constitution docks. After having a walk around town and a beer at the Irish Bar we headed back to the campsite to get showered and changed for our evening out in Hobart. Our first stop was the IXL long bar, which is housed in the old warehouses on the docks. It was very upmarket and we and we had cocktails and fizzy wine to start the evening off. We made our way to a few more pubs before hitting the Irish bar and then catching the late bus back to the campsite.The following morning we had to head off if we wanted to see the rest of Tassie before we left. We drove South to Cockle Creek and Recherche Bay, it is the most Southerly Drive you can make in Australia, the latter part 20km on a dirt track. The bush camping here was popular and we met a few people that we over from South Australia, they had set up their Caravans and had been there for about 4 days. They had a little boat and had caught some lovely flathead fish which they were going to have for their tea with some Oysters that they had picked off of the creek that morning, what a great way to live! We were not so lucky with the food and had sausage and mash, that night a little wallaby was hopping around in front of the vans as we settled down to sleep.